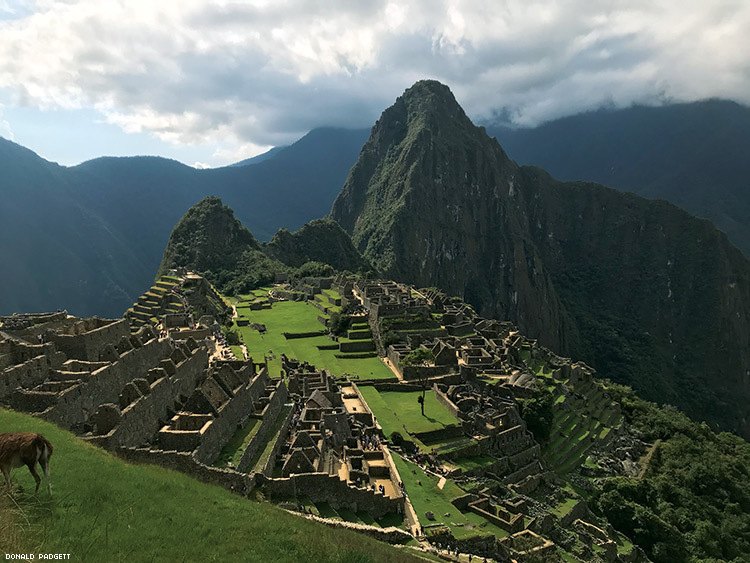 Visiting Machu Picchu, the ancient Incan citadel, is as powerful as everyone says. And now it’s more accessible, affordable, and luxurious than ever. It is impossible not to be awestruck when you take the first steps into Machu Picchu in southern Peru. The sacred city in the clouds is rightly famed for its stunning views, meticulous terracing, precise stonework, spiritual aura, and mysterious origins. Surrounded by peaks covered in the lush green of the rain forest and jutting near-vertically into the sky, the first question that comes to mind is how our fellow human brethren from centuries past were able to accomplish such an astounding feat. Mountain Lodges of Peru (MountainLodgesofPeru.com) provides affordable and fully customizable packages of five to seven days to Machu Picchu and the surrounding Andes. A few nights earlier in the comforts of their exclusive Huacahuasi Lodge, our tour guide, Andres Adasma, had given a presentation on stargazing and the archaeoastronomy of the Incan empire. We were high in the Andes, above 14,000 feet, and satiated after a of locally-sourced fish and the obligatory but always welcome pisco sour. His lecture was intriguing. Regardless, I was star struck. Pun intended. Of course, by now I had come to expect the unexpected from Peru. Here I was high in the outback of the Andes, yet later that night I was relaxing in my room’s private hot tub overlooking a 1,000-foot valley and waterfall, framed by jagged mountains higher than the Rockies. I was equally surprised by the accommodations. Llamas wandered around the jacuzzi and communal areas of Lamay Lodge, while Huacahusi Lodge is perched high astride a glacial valley. Outside the ancient city of Ollantaytambo, individual townhouses featuring full kitchens, private patios, and secluded gardens of the Kuychi Rumi Lodge (Urubamba.com) welcomed us. Meals were both impressive and varied. From gourmet pizza prepared in wood-fired open ovens as we watched, to delicate soups, grilled chicken, and succulent fish, the dining was truly memorable. Over lunch with native artisans in the small village of Choquecancha, we learned from locals how the ancient arts are passed on to future generations. The resident women in attendance wore garments woven from alpaca wool using their own hands and looms. The indigenous artisans offer their wares for purchase in a centuries-old building repurposed by the Mountain Lodges of Peru to facilitate these ancient Peruvian traditions. This knowledge has been passed from generation to generation countless times but now faces the threat of disappearance. To combat this, MLP sponsors educational seminars, and transports elders (primarily women) to other villages in the surrounding valleys. Here the older generations impart their knowledge to the younger, sharing both their cultural heritage and the ability for the region to continue and attract tourism dollars of those who come seeking t handicrafts. The tour helps support the effort to keep these cultural practices alive and viable. Of course, the prime draw to Peru is Machu Picchu, and visitors will not be disappointed. Be prepared for crowds, especially during the mid-day hours. 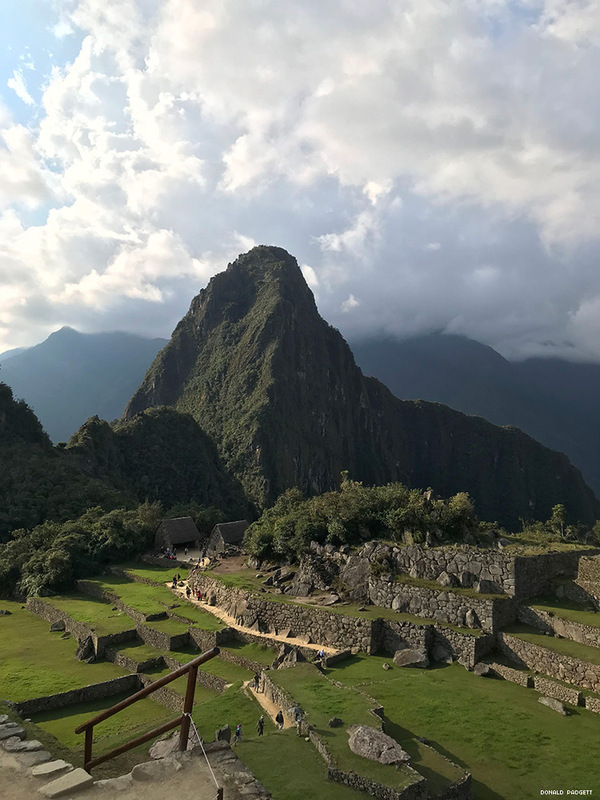 Buses continuously run visitors up and down the mountain from the touristy but delightful town of Machu Picchu Pueblo (also known as Aguas Calientes), where you’ll find accommodations if you’d like to stay a little longer. Doing so is smart given that crowds do thin later in the day. The daily trains from Cuzco that bring thousands of tourists to visit the mountain citadel on day trips depart by mid-afternoon, so the site is significantly less crowded in the later hours, especially just before sunset. I found that one can wander amid the ruins relatively undisturbed during this period and the light is beautiful. be said for a relaxing stroll amidst the private paths, streams, and waterfalls that are found throughout the property, especially after a long day with the crowds on the mountaintop. Alternatively, there are hundreds of other properties to choose ranging from basic hostels offering a bed in a communal environment to luxurious accommodations. The Peruvian Andes are filled with historical sites from the Incas and their predecessors. The indigenous people here were slaughtered, enslaved, and sickened by deadly western illnesses. The Spanish attempted to wipe away all traces of Incan culture including these sacred sites. Then the colonizers built upon what was left — figuratively and literally. The archeological site of Písac is a series of terraces set high in the Andes at roughly 10,000 feet in elevation. While some of our tour group elected to go to the crafts market in town, a few of us decided to test our legs and lungs by climbing up and over a ridge of roughly 14,000 feet then down to meet the rest of the group for lunch and a further hike into the historical sites. The hike up was surprisingly strenuous and challenging due to the high altitude, but fortunately the trek down was a more leisurely stroll amid small, isolated villages and fields of wild flowers with jaw-dropping vistas so frequent they almost became commonplace. We walked on paths in use since long before the arrival of Pizarro and the conquistadors, and still in use today by children on their daily trips to school. The remains at Písac rival those of Machu Picchu for their stunning terraces and structures, but the same can be said throughout the Andes. A few days later, we were climbing the remains above the ancient city of Ollantaytambo, the site of the famous battle between a small band of Spanish conquistadors led by Hernando Pizarro and the massive army of the Incan emperor Manco Inca. Each of these sites has since been meticulously preserved and maintained, and wandering amidst their finely designed and sculpted walls and terraces was like stepping 500 years back in time. I was reminded how the Incan Empire was only the last of a long line of peoples of Peru who turned their eyes to the night sky, learned the complex movements of the stars, and developed unrivaled engineering and architectural prowess. My departure left me anxious to research further what I had learned and plan my return — which is perhaps the best indicator of a journey well-spent.